Keeping a motor home or trailer on the road isn't always easy. Wheelbases on motor homes are often too short while axles on trailers are too far forward. White-knuckle driving is as much a problem today as it was in RVing's heyday. On the manufacturer's side, the driver of RV safety (or lack of it) is still economics. Many prospective motor home buyers still want one that will whip around the parking lot with ease while many trailer buyers really like that light hitch weight in order to pull a bigger trailer with less of a towing vehicle. Although many of these buyers are thinking that it's all about choice, it's really all about risk. It's about staying on the road. 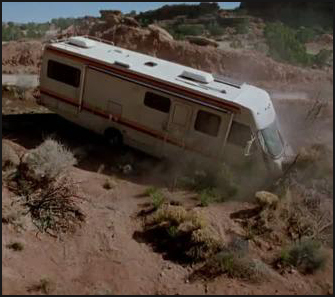 In our files we have far too many photos of RV accidents with devastating consequences. Although the causes of these accidents are often the common ones like speeding and falling asleep, the majority appear to be design related. For example: We know that short wheelbase vehicles - whether RVs, automobiles, or commercial trucks - are less stable on the highway than those with longer wheelbases. If you check trucker's forums, government studies on vehicle stability and safety, and Bill Estes' old articles (Trailer Life and Motorhome magazines) you soon realize that wheelbase - as well as center of mass and balance - is critical for motor home safety and that back-of-ball-to-length ratio (axle setback) is critical for trailer safety. Although there is no data on trailers' back-of-ball ratio, you can tell from photos on brochures or websites that there are far too many of them with the axles too close to the house's center. These manufacturers know better. They are simply giving the buyers what they think they want. So, when you are ready to buy an RV, you'll have thousands of choices with risk factors that are complicated and often mysterious. It's a conundrum! However, difficulty should not deter the search for the right answers. The effort alone will most probably reduce the risk of making bad choices. Our series on RV safety will get into the many problems that RV design is creating for RVers in the 21st century through articles like this and upcoming videos. How are the wheelbase and back-of-ball-to-length ratio (axle setback) calculations done? What would the optimal numbers / percentages be?